It's a minor miracle that this quiet, elegant 10-seater doesn't have a queue around the block during weekday lunch hours. We visited on an average Wednesday in early summer, and although the short queue did move slowly, the flavours at Shozantei should warrant much longer lines. On the menu is, simply put, a bowl of rice topped with premium kuroge wagyu beef, served with some pickles and a dipping sauce. 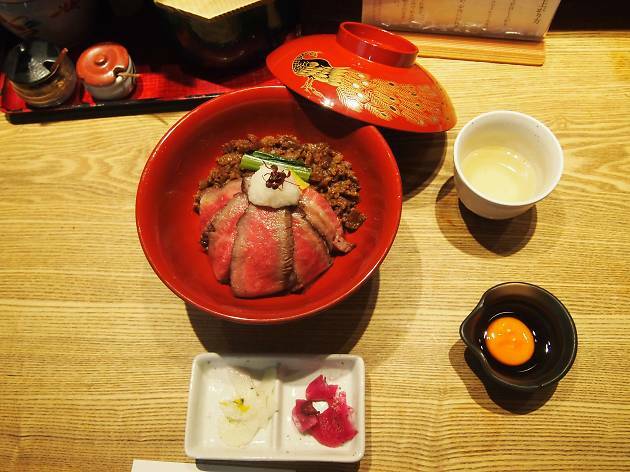 It's anything but simple in taste and execution, however, with even the cheapest option (ume, ¥1,000 excl tax) served in a pretty lacquerware bowl with both thinly-sliced, lightly grilled strips of beef and tender morsels of beef simmered in broth for hours to bring out optimum flavour. More pricey sets (take and matsu) may come with a piece of beef sushi, plus different types of beef toppings. Staff recommend digging into your food in three ways: first, taste the beef on its own; then have some dipped in the egg-tare mixture; and finish off by putting some of the rice into a separate bowl and adding some of their signature dashi to make chazuke. We particularly liked the dipping sauce combination, akin to sukiyaki, but honestly, the beef is of high enough quality to stand on its own. The chazuke is a great move, as it is both a mellow ending and beefs up (sorry) the meal – be sure to put in some of the chunks of simmered meat too, and add some wasabi and sliced nori to taste. The yuzu peel (served on top of your rice) is supposed to go in the chazuke too. Note that Shozantei operates multiple meat-centric restaurants in the area; if you simply type in 'Shozantei' into Google, it will likely send you to the main restaurant down the road, which deals in Korean-inspired fare for lunch and luxurious course meals for dinner.